The year is now officially done! I cleaned and reorganized the class today. I love doing this, even though I’m the type to leave the cleaning to the last minute. I don’t like the feeling of an empty classroom while the kids are still around. Even though I found the year challenging, it was a good challenge. Plus, I can say that everyone was pretty happy right up until the end of the year. There were certainly times that I thought I was nuts for taking on this level (kindergarten-grade 1). Oh my!! But in the end, some very rough little diamonds were polished up a bit…although with a lot of hard work!! I was very happy with my ‘Allowance Project’ in the end. It was definitely the best math idea that I have had at this level so far. And it wasn’t just a math idea, either. It was about managing money, committing to responsible routines, and giving to charity. The children enthusiastically tracked their savings, recorded their spending, and learned all about nickels, dimes, quarters and dollars. Plus, they ended up with such cute little birdie banks! 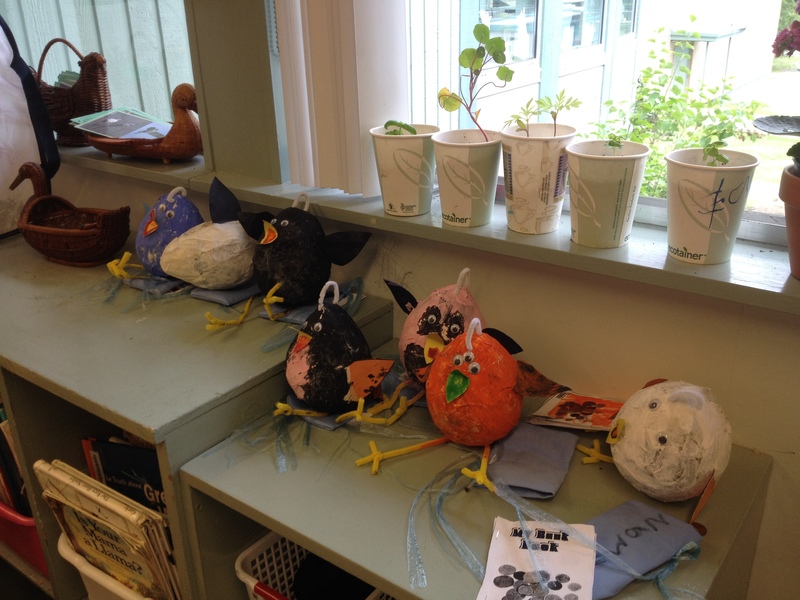 These were so simple to make (paper-mache over a balloon, then add birdie parts). I’m going to build on this idea next year. I would like to change the charity day to be a shopping day, for a start. Parents could donate non-perishable food items and then the children could shop for these on charity days, spending their own hard-earned money to do this. This year, I simply gave them three coins (a nickel, dime and quarter) and asked them to choose some for savings and at least one for giving. It was interesting to see the decision-making process at work on charity day! However, the ultimate recipient of their charity (Children’s Hospital) was a little too removed to really impact the kids. I think shopping for food bank would make it more real. 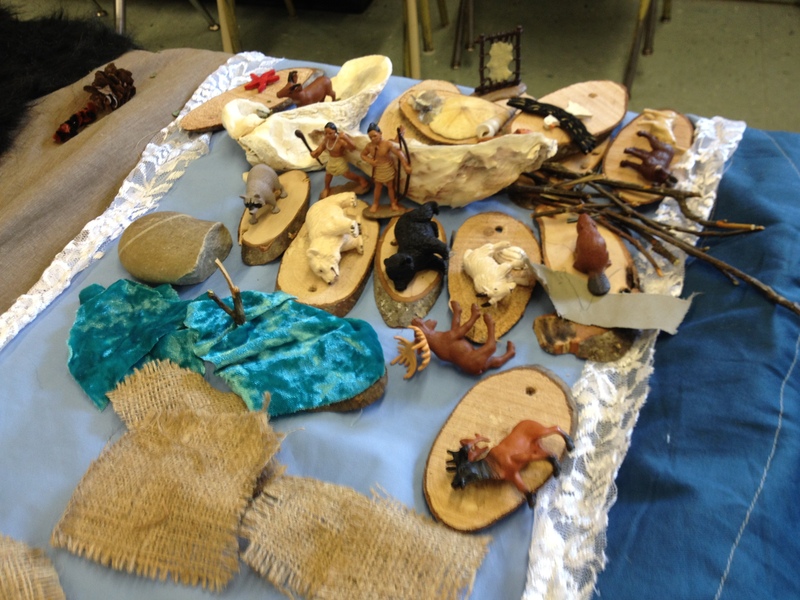 I was also really pleased with my First Nations play land that I created out of fabric. I asked the parents to donate bits a pieces of fabric. I ended up with a ton! I then stitched the whole works together to create a really beautiful play tapestry. When it is not in use, I hang it on the wall. I found little plastic First Nations people, North American animals, shells, wood, small twigs and extra fabric for the children to use with it. It was very popular and a great way to connect with many of the stories, art projects and teachings that we had experienced during the year. I ended up making a couple of island tapestries as well (peopling them with little plastic European settlers). Crazy spending my weekend doing this, but worth it in the end. Finally, I have become a insatiable collector of bones, nests, feathers, rocks, dead bugs and pretty much anything that I know young children find fascinating to touch and observe. I have baskets of these items! Every morning I put out a different set of items and paired them with matching books and puzzles. I always had their science journals handy and encouraged them to write and draw as part of their observing. Again: very worth it. Not everyone took to the writing and drawing part, but all seemed to enjoy checking everything out. Those who did write and draw took their work very seriously. It was always interesting watching this. I felt like I learned a lot about each child in this process. I had other good experiences and ideas as well (and others that I quietly abandoned), but I’ll save those for later!